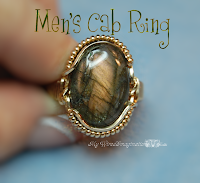 I recently posted a new tutorial Mens Cab Ring. It has since been pulled from publication on all my sites. It was reported to me, that someone I have respected for a long time felt my design looked to close to theirs. While the text and images and construction is my own, in deference to this person I have removed the tutorial from sale. I felt I developed improved techniques for constructing a ring of this type. The text that I wrote and the pictures I took reflected these improvements in techniques. While I realize this is a disappointment to some of you, I felt this was the correct thing to do. I may apply these same improved techniques to another project, and will certainly let everyone know when that happens. I appreciate your inquiries, and support. thats a shame as I loved your version of a wrapped ring. I am extremely disappointed. I wanted to see how you made that. Is there any way we can get a copy of the tutorial. I am always looking for new techniques. Thank you Essential, but I can't put this back in my shops. I took this out of publication as a courtesy – to put it back, or even sell it to a few off site, would feel like going back on my word, and I can't do that. I appreciate your interest, and hope you understand.